Comfort and luxury of Sunset Pointe! Sunset Pointe condos offer a large open floor plan with West Indies style architecture and every room opening onto an outside porch. There are only four units per building. 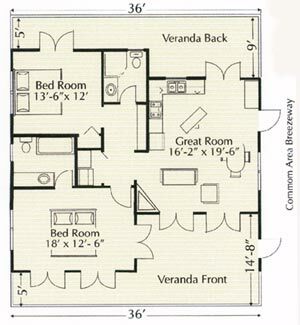 Each upstairs 2 bedroom, 2 bathroom unit has 1,674 square feet including the covered private porches, plus optional loft area. The common area of each building includes 234 square feet of breezeway on each floor and 140 square feet of observation deck on the third level. 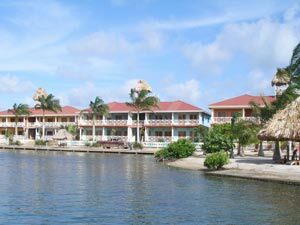 With a dedication to quality and pride ownership built by Albert Lowen, one of Belize's premier contractors, having built 7,000 to 8,000 square feet homes on the peninsula. The construction is second to none and is far stronger than most condo projects built on the Florida Coast. If you are interested in purchasing a unit at sunset pointe, please read our sales info at the bottom of this page. 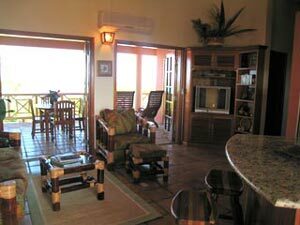 Luxurious and spacious two bedroom/two bath top floor waterfront condo that sleeps 7-9 people. 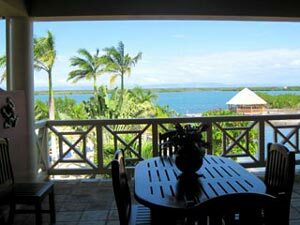 Two equally beautiful views that overlook the Caribbean Sea, Placencia Lagoon and Mayan Mountains. Boasts modern, fully equipped kitchen, washer/dryer, cable, flat screen TV, stereo, DVD and fully air-conditioned. 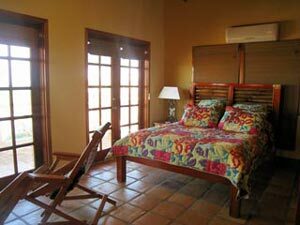 Features West Indies-style architecture, saltillo tiled floors, and porches off every room. 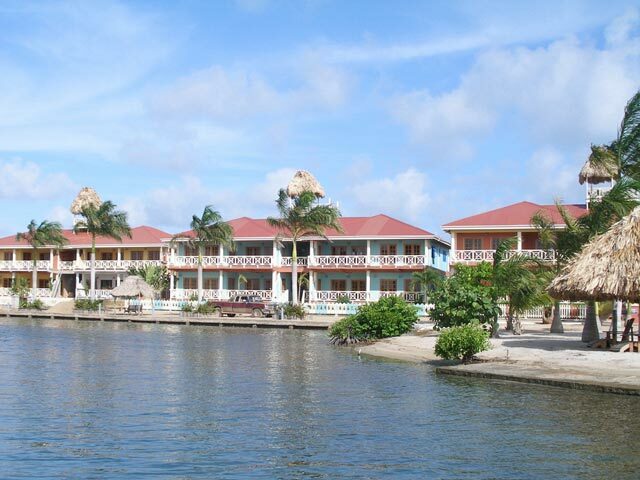 Amenities include: swimming pool, jacuzzi, outside grill area, 100 ft. Caribbean-side private dock w/ palapa, Lagoon-side fishing dock and third-floor widow's walk w/ palapa. Enjoy some of the best views and sunsets Placencia has to offer. 24 hr Caretaker on site. 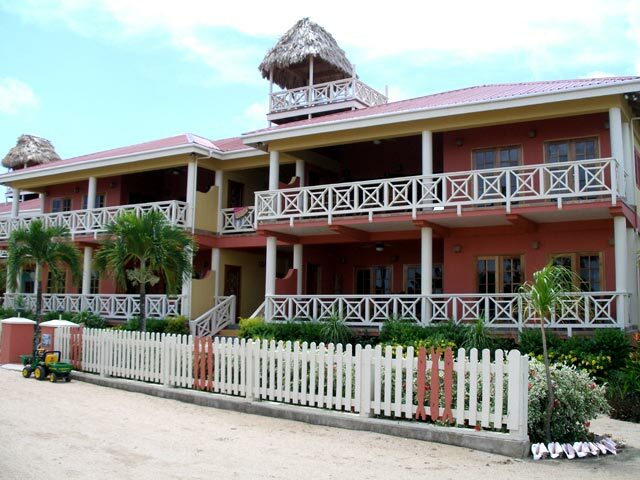 Located just a short walk to center of town where you will find great restaurants, beach bars, grocery store and everything you need. A true paradise! Guides available to pick you up on-site for some of the best fishing and adventures. 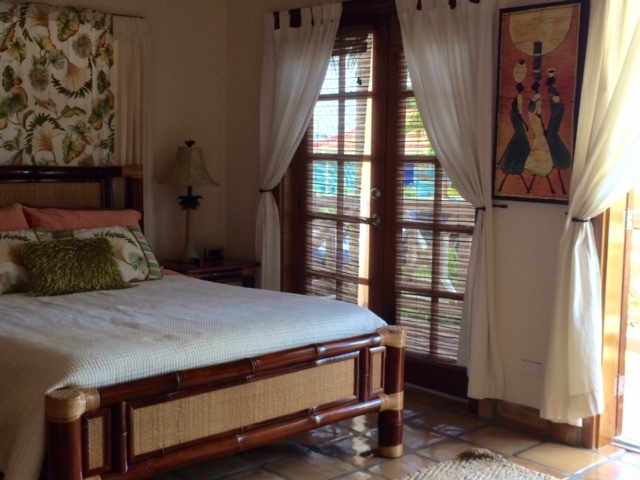 Two bedroom/two bath first floor garden unit sleeps 5 in two queen beds and one single bed. 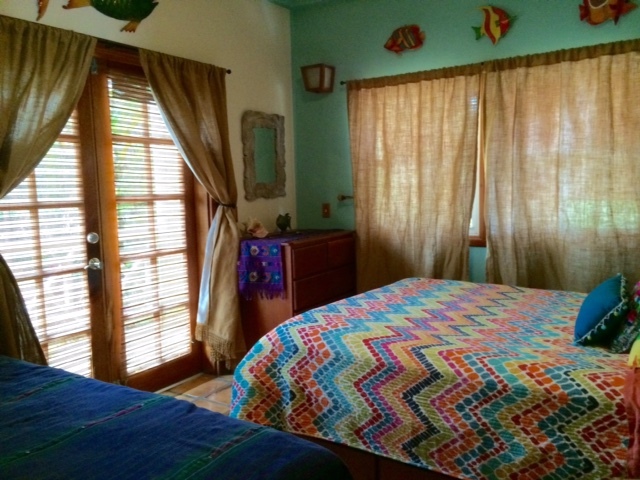 Designer-decorated with traditional tropical decor, hand painted Mexican sinks, and saltillo tile floors. Private porches and water views from every room. Each room has its own A/C unit, fully equipped kitchen, washer/dryer, cable TV and the same amenities as described in Unit #4. 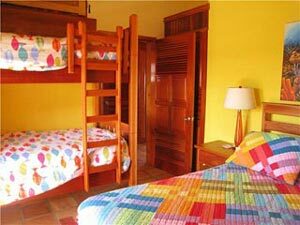 Spacious two bedroom, two bath units with porches that overlook the Caribbean Sea on one side and the spectacular Placencia Lagoon and Mayan Mountains on the other side. 225 ft. sea wall on the lagoon side with private safe dockage for your boat. This is the southern most point on the peninsula with immediate access to the Caribbean Sea. 100 ft. viewing dock with slips for six boats at entrance to the lagoon. Quality concrete constructions. Built on 22 pilings, 40 ft. deep. Concrete walls interior and exterior with stucco finish and metal roof. Saltillo Mexican tile floors throughout. All tile bathrooms with hand-painted Mexican sinks. Master bath has garden tile tub. Solid custom made Mahogany French doors. Seven double sets in each unit! Whirlpool appliances in kitchens plus washer and dryer furnished. Windows walk for sunbathing or stargazing on the third level of each building. 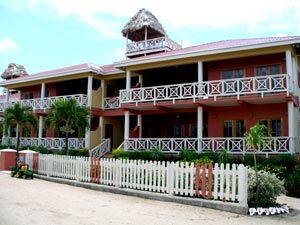 Hinged closable West Indies style shutters over all windows. Multi-line cable and telephone underground wiring. Custom made kitchen cabinets with center-island all made of exotic hardwoods. 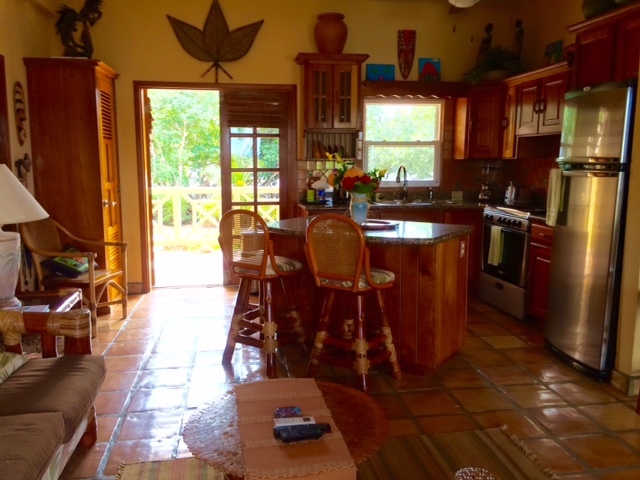 West Indies style architecture with open floor plan and porches off every room. Only 16 miles from the second largest barrier reef in the world. 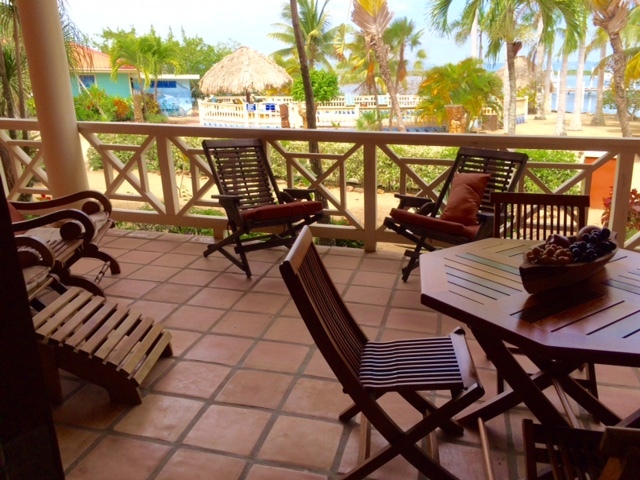 A two-minute walk from your condo to the center of Placencia. You will find great restaurants and beach bars that will cook your fresh caught fish to perfection. 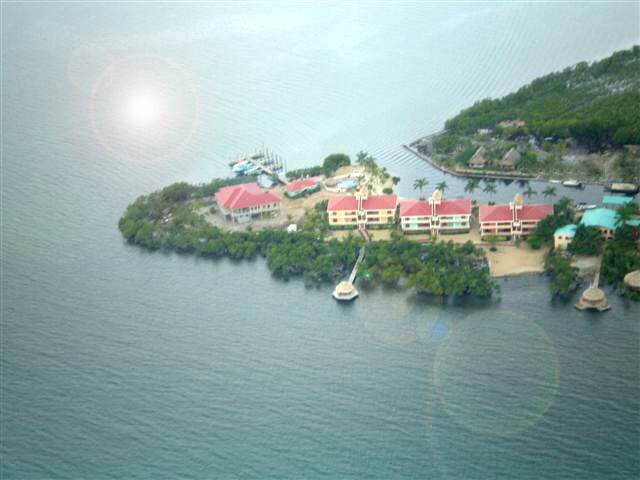 If you enjoy Belize, Placencia, the beach, the Carribean, the adventures that abound or the fishing please contact Janis at ewinche713@aol.com or (904)536-8692 or locally Francisco Ruano at fruano82@yahoo.com or 671-4740. 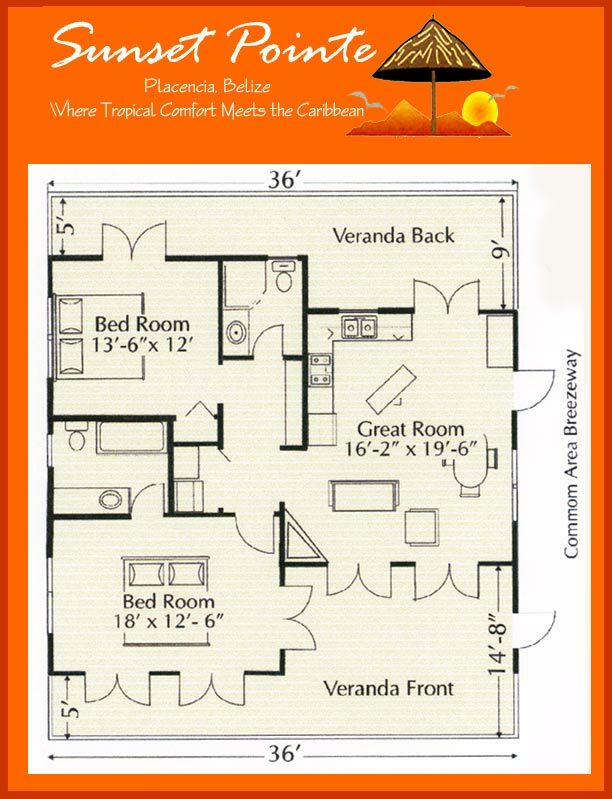 The three builings at Sunset Pointe - Sea House, Caribe House and Lagoon House each feature four units of with a similar floor plan.